PiCk oF ThE DaY- Formal Fun !!! | The Shopaholic Diaries - Indian Fashion, Shopping and Lifestyle Blog ! PiCk oF ThE DaY- Formal Fun !!! I had a short haul at SAROJINI NAGAR market few days ago, I wanted to post about my experience as it was the first time I went there.. But I would do that in a couple of days as I have been acting lazy for clicking the pictures !! Today we had an Ice-breaking session for our juniors and during the introduction video, I was tagged as- Teddy Bear on the Loose !! I was lil surprised to find that title as I was expecting something related to my shopping addiction( as am continuously teased in the class for that). Nevertheless I loved being called teddy and had great fun today playing games and interacting with the juniors. So I picked some stuff and created outfit which I would have loved to wear to my office.. I am in love with this Coral pleat detail blouse especially the color and the sleeves. I have teamed it up with a pair of white trousers and cute BOW court shoes. 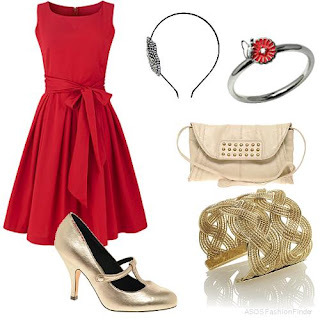 Anyways the Red dress is sooo adorable with the cute belt and pleats. Pairing it up with Suede court shoes and Gold cuff would dazzle the look. So that's all for the day.. If anyone of you find such red dress in any of the Indian stores please let me know as I am dying to get one. And I promise to do the Sarojini Nagar haul post soon !! OMG the first assemble is just too fabulous!! Hostel days? ah I so miss that. thnxx jiyaa !! am good !! hvng fun for now !! :D how are you doing?? and yess the 1st is my fav too !! 1st haul at Sarojini Nagar Market- Delhi !! I am happy- 1st Blog Award !!!! ACCESSORIES CRAZE- by Dazzling Bling !! Fashion And You Haul !! Haul at GK- M block market and Indirapuram ! !